When Park Gun-ha defected to South Korea in 2005, he first hoped to find a well-paid farm assignment separating newly hatched male and female chicks. But, like many other moments in his life, things did not go as planned and the former North Korean customs officer instead migrated to Thailand to sell cosmetics. He was later deported back to South Korea, where he began studying in Seoul to become an electrician. Yet another unexpected career turn placed Park at the helm of a Seoul-based activist group called the North Korea Intellectuals Solidarity (NKIS). When he testified with 20 other refugees at the UN General Assembly in New York earlier this year in April, a North Korean envoy tried to interrupt the witnesses and started a shouting match. Park and NKIS are part of a cottage industry of North Korean defector-run associations in South Korea. Their raison d’être is to protest the Pyongyang regime and advocate for the over 28,000 North Korean refugees who have resettled south of the DMZ since the Korean War’s 1953 armistice, the overwhelming majority arriving in just the past 15 years. For most of these defectors, activism is a better livelihood than working in unskilled and low-paid sectors of the South Korean economy, as is commonly their fate. While defectors remain a key source of information about North Korea, their accounts have sometimes been found to include lies or embellishments. Inaccuracies recently emerged in the narratives of several high-profile refugee, warranting a closer look at the ways in which media organizations, foreign governments and aid groups may unknowingly offer defectors financial incentives to stretch the truth. The most widely reported of these controversies came to light in January 2015, when author Blaine Harden revealed that Shin Dong Hyuk, the protagonist of the 2012 book Escape from Camp 14, admitted to intentionally falsifying some details of his background, including the locations and times of his imprisonment. A second, slower-boiling dispute involves the 21-year-old defector Park Yeon Mi; her memoir is not due out until later this year, but media commentators, bloggers and other North Korean refugees already suspect she embellished the story of her escape with elements lifted from other defector accounts. Journalists and other writers regularly note that they cannot independently verify statements by North Korean defectors. Authors give the benefit of the doubt to their subjects in such cases, at least until holes emerge in their stories. In a new foreword to Shin’s account, Harden acknowledges that he should have “done more to examine the psychological dimensions of his (Shin’s) relation to truth.” Park Yeon Mi and her book’s collaborator, Maryanne Vollers, declined to comment for this article, but both have attempted in press statements to explain apparent inconsistencies in Park’s accounts. Sources in Seoul’s close-knit refugee and advocacy community have refused to publicly discuss whether specific inaccuracies appear to be deliberate lies or honest mistakes, but several have spoken in general terms about the trustworthiness of defector accounts. Sokeel Park, director of research and strategy at Liberty in North Korea (LiNK), acknowledged that “defectors don’t necessarily understand Western journalists’ required standards for ‘the truth’” and might alter their histories to protect themselves or their families. Kim Seok-hyang, a professor at the Institute for Unification Studies at Ewha Women’s University in Seoul, said lying is “a way of surviving” in North Korea and telling the truth “is a good way to kill yourself.” Many defectors live for years in the South with a “guiltless” habit of fibbing, and the attention lavished on some may cause them to “become drunk with celebrity [status]” and start believing their own lies, she said. Still, North Korea’s opacity creates a need for “professional” defectors like those at NKIS, and the dozens of other similar organizations, Kim added. North Korea is less open to foreign observers than the Soviet Union and Cuba were at the height of the Cold War, and so North Korean refugees must explain aspects of their native country that are “beyond our imagination” as international observers. Shin Mi-nyeo, director of the refugee support group Saejowi, described the motivations of North Korean defectors in more cynical terms. Some journalists pay them for interviews, while political and security organizations provide them stipends for giving lectures, she said. Kim Seok-woo, who served as South Korea’s Vice Minister of Unification from 1996 to 1998, defended the sincerity of activist defectors. North Korean refugees generally keep low profiles to protect family members still in the North, and those who enter activism prove their commitment to opposing the regime by assuming risks in speaking out against it, said Kim, who now heads the National Development Institute in Seoul. Only a small segment of the community, up to 5 percent, partakes in activism or talks publicly about their experiences back home. Kim said South Korean politics might have pushed some North Koreans into activism during the Sunshine Policy years (1998-2007), when Seoul pressured refugees not to endanger inroads with Pyongyang by airing grievances against their former rulers. Some North Koreans entered advocacy at that point and sought foreign financial support to advance their political objectives. South Korea’s political pendulum swung rightward in 2008, but Seoul’s support and funding for refugees have only improved “little by little,” Kim said. Tighter scrutiny by NED may have prompted some defector-led associations to instead seek funding from churches and foreign activist groups with deep pockets and less red tape. The New York-based Human Rights Foundation (HRF) recently raised $59,000 for six defector groups as part of their “Hack North Korea” program, according to HRF’s Alex Gladstein. One of the recipients is Fighters for a Free North Korea, which smuggles anti-Pyongyang material into the North on USB sticks and launches leaflet-filled balloons over the DMZ. 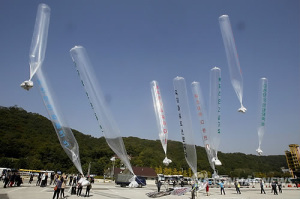 But some North Korea analysts, such as Dongguk University’s Yang Moo-jin, described such balloon launches as “a media stunt” aimed primarily at winning foreign contributions. “Very few” North Koreans get flyers from the balloons due to weather and other unfavorable conditions at their border deployment point. Yang added that some North Koreans may enter activism because the South Korean government does not give them sufficient training to find jobs and make a living in mainstream sectors. When North Koreans arrive in the South, the country’s National Intelligence Service first interrogates them in an attempt to resolve inconsistencies in stories and catch potential spies. Each refugee then receives three months of education on the South’s market-driven economy and up to about $41,000 in resettlement assistance, including a housing stipend, school tuition, and incentives for obtaining a job. Government data shows that the unemployment rate for defectors last year hit 6.2 percent, a new low that is still about 2 percentage points higher than the national average. The majority of jobholders, roughly 24,500, are employed in manual labor, the informal jobs sector or volunteering, and just under 2,000 refugees hold university degrees. Discrimination further complicates prospects for defectors. According to a report by the Asan Institute for Policy Studies, “social prejudice and stereotypes of North Korean refugees” make it challenging for young escapees in particular to adjust to the South. Saejowi’s Shin Mi-nyeo says still more educational support is needed to help defectors fit in and find better paying and more rewarding work, thus giving them more attractive alternatives to entering activism. Mary Ann Jolley, “The Strange Tale of Yeonmi Park,” The Diplomat. December 10, 2014, http://thediplomat.com/2014/12/the-strange-tale-of-yeonmi-park/. “Yeonmi Park: The Defector Who Fooled the World,” JooPark3782 Blog (blog), December 22, 2014. http://jooparkblog.blogspot.kr/2014/12/yeonmi-park-defector-who-fooled-world.html. Two North Korean defectors, both active in advocacy in South Korea and abroad, made accusations that Park is taking the stories of other refugees. They declined to be named for this report. Blaine Harden, “Blaine Harden: Author and Journalist,” Blaine Harden, http://www.blaineharden.com. Maryanne Vollers, “The woman who faces the wrath of North Korea,” The Guardian, March 15, 2015. http://www.theguardian.com/world/2015/mar/15/park-yeon-mi-north-korea-defector. The Diplomat updated Mary Ann Jolley’s article with a response from Park: http://thediplomat.com/2014/12/the-strange-tale-of-yeonmi-park/. Sokeel Park of LiNK estimates that 1 percent of North Korean defectors are involved in advocacy, while Kim Seok-woo estimates the number to be between 3 and 5 percent. US National Endowment for Democracy, “North Korea,” http://www.ned.org/where-we-work/asia/north-korea. Ministry of Unification of The Republic of Korea, “2014 Report on North Korean Defectors,” http://www.nkrf.re.kr/nkrf/archive/archive_01/kolas/kolasView.do?key=70034035&kind=DAS. Myong-hyun Go, “Resettling in South Korea: Challenges for Young North Korean Refugees,” Asan Institute for Policy Studies Issue Brief No. 24, August 28, 2014.